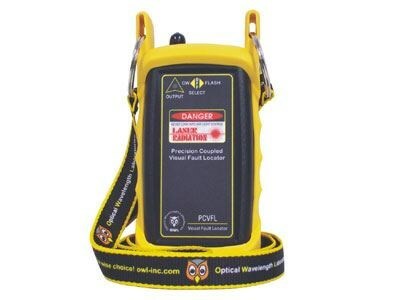 PCVFL (Precision Coupled Visual Fault Locator) is a light-weight, hand-held tool used to quickly troubleshoot faults in the continuity of both single mode and multi-mode fibers, especially at fiber launch points or in OTDR dead zones. A high intensity visible red laser beam is precision-coupled into a optical fiber; breaks and micro-bends in the fiber deflect the red light into the fiber jacket, producing a red glow at the point of the fault. Typical battery life in CW mode is 15 hours, and the short 12.5% duty cycle in pulsed mode extends the battery life to 120 hours of continuous use. Unlike standard light pens, the PCVFL precision-coupled visual fault locator (VFL) is optimized for fiber optics. An optical ball lens placed near the laser output focuses the red laser light for optimum coupling into optical fibers (often most pen-style laser pointers do not have this feature), and special electronics prevent the red laser from burnout (a common problem with pen-style red laser pointers), increasing the life of the VFL. The PCVFL ships standard with a 2.5mm universal connector port.